Editor’s Note: In the year 1906, British Adm. Sir Jackie Fisher launched a revolutionary new type of a naval surface combat ship, reflective of his personal coat of arms motto: “Fear God and Dread Nought!” The new ship would become known as HMS Dreadnought, the world’s first modern naval battleship, and it brought about the world’s first arms race. When HMS Dreadnought was built the U.S. Navy’s proving ground for large caliber naval weapons was at Indian Head, Md. Built in 1898, Indian Head was relatively new at the time of Dreadnought. But, as the new British battleship began eclipsing all known records for long gun accuracy in the first decade of the 20th Century and rendering the rest of the world’s navies obsolete, it was soon realized that Indian Head was insufficient to support the longer ranges of the new weaponry that modern battleships would now have to have. A new naval gun range would be needed. It just so happened that a long stretch of fairly straight Potomac River existed approximately 20 miles downriver from Indian Head. It was located in King George County, and, when it was first built in 1918, it became known as “the Lower Station” of Indian Head. Flash forward 94 years of today as the drive for a museum to honor nearly a century of scientific technology, invention, and innovation was formally launched last week. The museum, much like Fisher’s vision of his HMS Dreadnought, will serve to underscore the products of engineering; some of the finest that this nation has ever produced. And much of that engineering came from the minds of the women who served Dahlgren through the years. 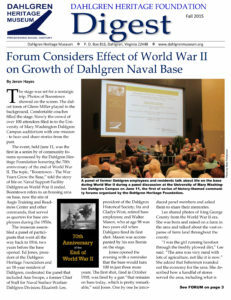 At the official inaugural of the Dahlgren Heritage Museum, held at the Dahlgren campus of the University of Mary Washington, four of those women reflected on that service before an audience of more than 200 attendees who came to hear about their experiences. Gladys West led off the panel of the four that highlighted the evening’s focus: “Women in Science and Technology at Dahlgren.” West came to Dahlgren in 1956. She had just graduated from Virginia State University and had originally set her sights on a career as a math and science teacher. West went on to marry here and raise a family while at the same time working on what was then one of the nation’s first super computers, the Naval Ordnance Relay Calculator or NORC. She also helped pioneer what was later to become the Global Positioning System and later earned a doctorate degree in public administration. Next up on the panel was Ann Swope, at Dahlgren since 1981. Swope came up through Dahlgren’s co-op plan, beginning as an environmental scientist and ending up as current chief of staff at the base’s largest tenant activity, the Naval Surface Warfare Center Dahlgren Division. “I was hired over the phone,” Swope remembered, adding that she came from a family steeped in biological science but stressed that she “didn’t want to go into med school” because of the hours demanded of doctors. Also awkwardly discovering a male-dominated environment was Dawn Murphy. Murphy, who came to Dahlgren in 1983 as a computer scientist supporting the backbone of the Navy’s surface combatants, the Aegis fleet, found herself the lone woman on an Aegis cruiser. Cynthia Holland anchored the panel and spoke about her job on the base’s current premier project, the Navy’s experimental electromagnetic railgun, while at the same time holding down her other job, that of a full-time mom. The evening, hosted by the museum’s foundation, was emceed by Ed Jones, editor of Fredericksburg’s Free Lance-Star newspaper and president of the Dahlgren Heritage Foundation. Jones, the son of a Dahlgren engineer and a graduate of Harvard University, grew up on the base and was educated through primary schooling at the Dahlgren School, which he has often described as the cornerstone of his learning experience. Thus far, the museum’s foundation has collected approximately $140,000 in various kinds of donations. Its goal is to raise a total of $1,500,000 to operate the facility, which will be located at the former King George welcome center off U.S. 301 at the foot of the Harry Nice bridge. The U.S. Navy will donate several obsolete cruiser and destroyer gun barrels and carriages to enhance the building. Additionally, the museum will feature a panoply of Dahlgren historical items that were built for the Navy. Such items might include the famed Norden bombsight, static displays of guided missiles and remote controlled airplanes, possibly notes on the triggering device for the first atomic bomb, plus parts of the world’s first computers.